Sometimes I have a problem with enough. I mean, how much IS enough? I love to read. How much time spent reading is enough? How much is too much? I love to write. How many words are too many? How many are just enough? I love to art journal. Just how many markers does one need? How many are too many? I love to teach Bible study. But how much is enough? Is teaching multiple Bible studies at the same time too much? I love antique quilts. How many can I have to have just enough that I don’t have too many? Oh and I have a thing for fruit jars too. At what number does a collection turn into an obsession? And I’m not going to even talk about scrapbook paper, potato chips, t-shirts or flip flops. It would be wonderful if somewhere there was this master list for the universe that made it very clear where the line was between enough and too much. But we don’t have this. And the truth is, that number where enough turns into too much is different for everyone; especially when we begin considering addictions and disorders. Sometimes, many times, simply one of something is too much. I believe we all face this question of “what is enough” on a daily basis, even hourly; at least I know I do. In his letter to the church in Corinth, Paul recognized that they were facing this issue also. So much so that he even gives his instruction twice, I Corinthians 6:12 and again in chapter 10 verse 23. ​The church was struggling with the new way in Christ of grace vs law. They had been used to following the letter of the Old Testament law, which was very specific, but now had freedom from the law through grace from Christ. For example, eating certain meats had been forbidden under the law, but now free from the law, eating those meats was allowable. But was it helpful? Was it beneficial for them? Paul was warning the church that just because some things had now become available to them, or legal, through grace, they were to proceed with caution and not become enslaved or mastered by anything. ​Oh what a relevant word of caution for us today! So many good and wonderful things God has made available to us, even provided through blessings; but can these things become too much? Can something God meant for good actually lead to sin? 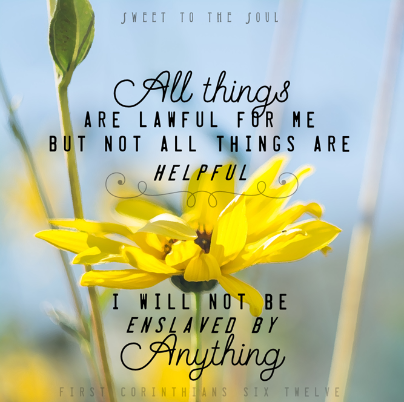 Let’s take a look at a few things which are good and lawful for us, because we are free from sin and no longer under the condemnation of the law, and see how we can wrongly take good things beyond the boundary of God’s will. The list only expands when we begin to consider many of our current advances in technology, like the internet and social media. And you may be thinking of so many more. God may be speaking to you right now about an area in your life which is moving close to ‘not being beneficial’ or maybe has progressed ‘beyond the boundary of God’s will’. A friendship, a relationship, a hobby even. Oh so many things God is pricking my heart over. Am I loving my blessings more than the One who blesses? Do I collect and collect and display and brag on the object or the Provider? Am I using what God provides for His glory or for my own? Do I use my ministry to say “look at God” or “look at me”? Am I spending more time with things, rather than with God? ​Do I spend more time on the computer or reading my Bible? Oh friends, I could list so many more things. Lord, Help me to see that You are enough. That I do not need a life full of bulk, only a heart full of You. I seek Your balance in my life today to do what is profitable without being mastered by anything, even good things. Amen. What do you think? What does "enough" mean to you? I would love for you to join the conversation below. Today's blog is part of the series #LiveFreeThursday with author and Proverbs 31 speaker Suzanne Eller. Come see what everyone is saying about : enough. All is permissible but all is not beneficial! And yet sometime I want it all! What's that selfish saying? I want it all and I want it now! Thank you for the list ... I need to print and post because some of those are spot on...I've either struggled with them myself or need to see what they can lead toward! Oh yes, wanting it all. God has a perfect portion for us to meet our needs, but we just want it all. Oh me too! I love this. I struggle with too much. Always too much of everything! But God is showing me how to reign it in and walk His narrow way in the things I was called to do. Thank you for your words! Thank you for this Kaylie, and for stopping by as well. Blessings to you #livefree friend. Thank you - for your ministry here on Sweet to the Soul! You're a blessing!! Bevy, I love how the Lord gently speaks to us through multiple avenues when He is trying to get a message to us. And I love what you are mentioning from that devotional. Yes! Cleaning out the closets of our hearts! That has touched me this morning. Jana, great post! Makes me analyze my heart, my intentions and the things that are too much sometimes in my life. Even blogging is on that list! Everything that we allow to much space in our hearts can take a place that belongs to God only. Great words for my heart today! I'm linking up with you too in #livefreeThursday. This is a thought provoking post. You are right. What is enough for one isn't an issue for another. I laughed at the thought of having too many antique quilts. I LOVE something like that and don't own any, but I don't know that I could have too many. So beautiful. Such memories. Such loving care put into the stitches. But there are other areas where I know I have more than enough, too much, and it's moved from a need to a want and has the power to become an obsession. Wise, wise post, my friend. Oh thank you for your encouragement sweet Crystal! I need to remind myself of the same everyday. Very good Word today! Love "we don't need bulk, but more of You". Amen. Thank you! "Am I loving my blessings more than the One who blesses?" Wow! What a way to keep things in perspective! Thank you so much for your post. Visiting today from #livefree Thursday, and so very glad I came across your post! Thank you Jana. This is a subject the Lord has been dealing with me about. I've been working on clearing out things I don't need and limiting my tv and computer time, but boy that can be so difficult. I hope it's ok to ask...what is art journaling? It sounds like something I would love (hopefully not to excess). God bless you and keep you in tune with His perfect will for your life.